Do you want a stunning Cubic Zirconia bracelet? Look no further! Our Three Row Domed Princess Cut Cubic Zirconia Channel Set Bracelet features multiple rows of channel set brilliant cubic zirconia princess cut stones totaling 22 carats of the finest hand cut and hand polished original Russian formula cubic zirconia. The bracelet has a slight domed effect that adds to its distinctive look. 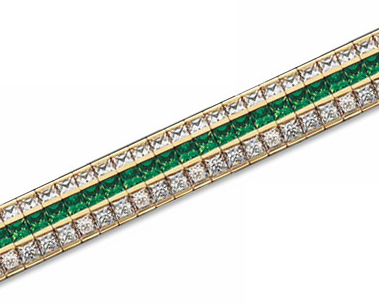 The bracelet measures approximately 10.25mm wide and is available in various metal and center row color options that include man made ruby red, sapphire blue, emerald green and canary yellow, pink and all diamond look cubic zirconia. 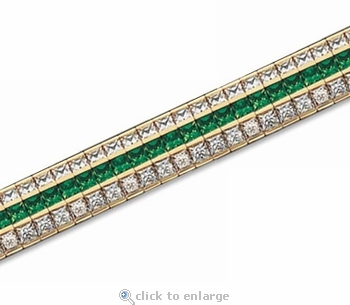 This bracelet comes standard in a 7 inch length and is also offered in an 8 inch length. Choose from 14k white gold, 14k yellow gold or luxurious platinum, please see the pull down menu for options. For further assistance, please contact us directly at 1-866-942-6663 or visit us via live chat and speak with a knowledgeable representative.